ParadropVR™ is a premium virtual reality attraction designed for indoor theme parks, family entertainment centres and destination visitor attractions. Unlike other VR attractions and flight simulators, ParadropVR™ is a fully immersive and interactive experience. 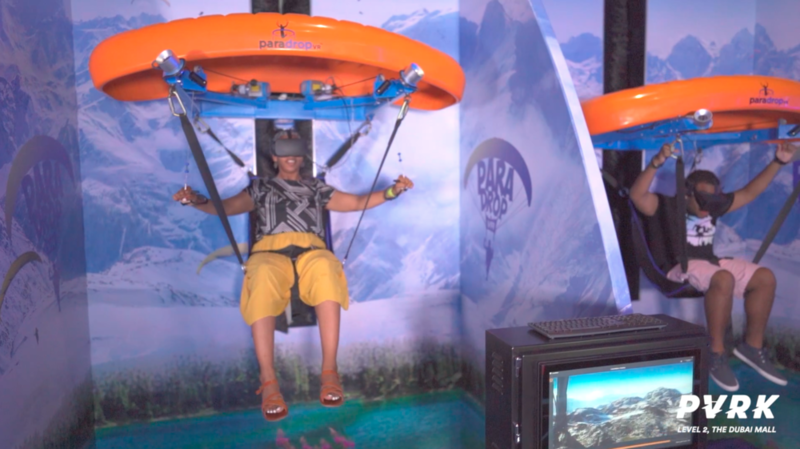 The ride combines self-controlled physical movement with free-roam virtual reality content to deliver a highly realistic paragliding sensation. Skill-based games offer another layer of fun and exhilaration, delivering high replay value for a range of leisure and entertainment settings. Both the media content and ride appearance can be customised for a holistic brand experience and wide-ranging storytelling applications. Available in a range of configurations from 1-40+ seats, ParadropVR™ is suitable for a range of venues from family entertainment centres and museums through to large theme parks. Design and content can be customised with your brand design - add as many units as you like.